NOTE: after using this system for a while it became clear that it is a piece of garbage. The on-board video couldn't handle 3D, nor even serious 2D, and when I installed a good PCI video card, the computer's power supply made a horrible high-pitched screeching noise whenever the video card had to work hard. Eventually the PSU died from this -- it gave a loud pop and smelled of toasted electronics, and it was no more. I also was never able to get the disk controllers to do CD ripping, no matter which drivers I tried. I have to conclude that they were just buggy controllers on the motherboard. They also would not let me boot from any bootable CD, and I tried several different CD-ROM drives, which booted fine on other systems. The bottom line is that I'm sorry I bought this system. It looks cool but it's junk. Inside, there's room for one 5.25" drive (CDrom, DVD, etc), one hard drive, and one floppy drive (or you could leave that out and put another hard drive in). 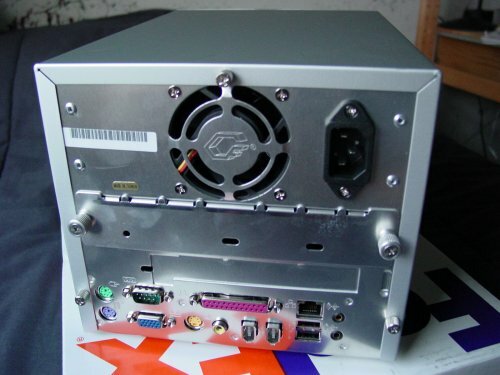 The unit will accept FCPGA/FCPGA2 Intel Celeron and Pentium III processors. I put a Pentium III 1.13A GHz processor (it's a P-III "Tualatin" chip) in mine. The only problem is that the thing sounds like a jet engine when you turn it on. You'll want to immediately replace the 60x60x25mm exhaust fan, and the 40x40x20mm power supply fan, with Papst or Panaflo quiet fans. (Or, if you can't find those in the right size, Vantec and Sunon also make pretty quiet fans.) "Quiet" is relative, but generally ~20-25 dBA or less is quiet... Papst fans are usually half that, nearly silent, but they're also very hard to find outside of Germany. For quiet fans, check out plycon.com, caseetc.com, or directron.com. For lots of good "quiet pc" information, try 7volts.com. And I have a page about making your computer quiet too. 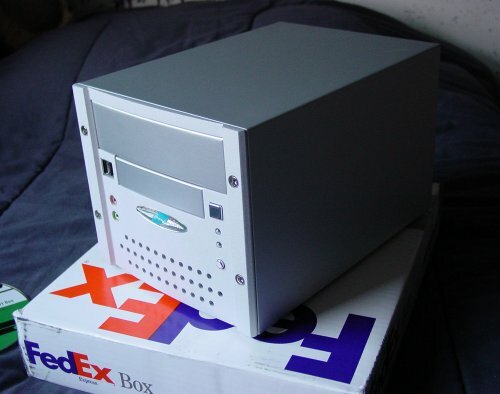 I got my SV25 in August 2002 at newegg.com on this page... the exact description is "SHUTTLE SV25 PIII/ CELERON (Tualtin ready) VIA PL133 SDRAM 66/100/133 MHz FSB SOCKET 370 BARE BONE PC FLEX ATX - RETAIL". It cost $205 for the case, motherboard, and power supply. 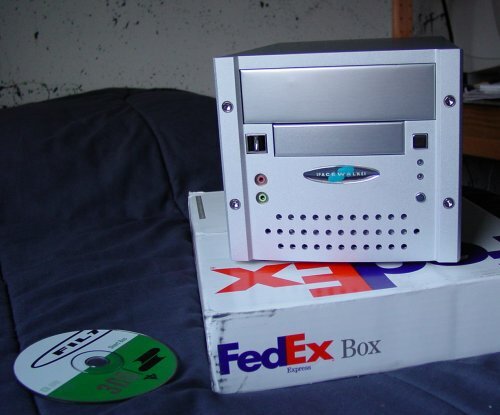 I also bought my Pentium III chip at newegg on this page for $110, and the description is "INTEL Pentium III 1.13GHz Processor CPU FCPGA2, Flip Chip, 256K Cache , 133MHz FSB, TUALATIN Retail Box". I moved a CDRW drive, hard drive, floppy drive, and some RAM from an existing system into the SV25. So including those components, the total cost for the system is around $450. Not bad! So I have 2 computers, one Linux and one Windows XP. I migrated my Linux system into this new little guy, and I'm going to buy another new little guy soon, to move my XP system into. This new one will probably be a "Checker Cube" made by Casetronic. He is available at CaseOutlet.com, iDot.com, and lillicomputers.net.